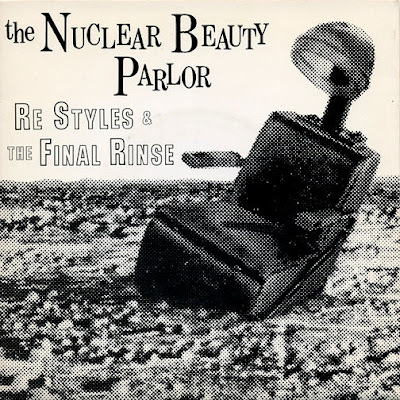 You know, I feel there's a piece of history that goes along with this 7". I'm glad you shared that! Thanks! 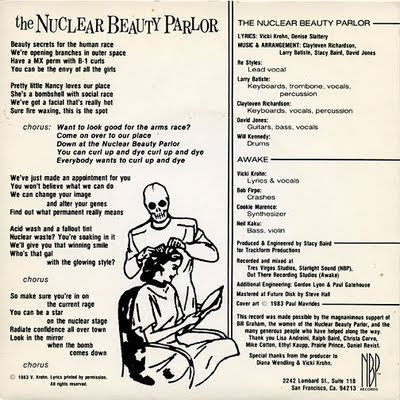 Correction: The Nuclear Beauty Parlor were women, not 'fags'. art fag does not designate gender...same as if I call you douche bag. "Art fag - That girl from your Art History 101 class who wears hobo-chic apparel (large-framed glasses are a must), has Anna Karina bangs, worships Tracey Emin and/or Andy Warhol, frequents the local art house to catch the latest Harmony Korine film, frequents independent art galleries (ie, White Box and The James Fuentes Gallery in NYC) to view the latest New Ukrainian Painting installation, and reads Adorno for "fun" whilst sipping red tea, black coffee, box wine, and/or PBR. Probably listens to a lot of Serge Gainsbourg as well. Fits in very well in the designated hipster area of town." Correction: this was the first and only recording by NBP. I've been wanting to hear this for a while. I failed to grab it the first time around for whatever reason. I'm thankful you re-uploaded it.